Oh boy, the tears poured with this one! What a great story! I really loved this title. This book was a light, flowing read, and yet it was the kind of book that touched me inside and kept me thinking of the story throughout the day! 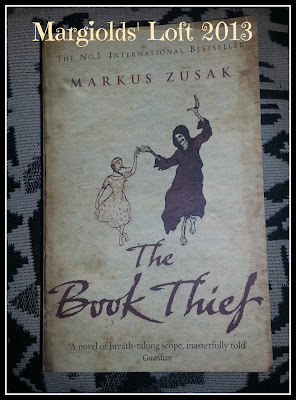 I found myself remembering scenes from the book and trying to remember which movie the scene I had playing in my head came from, to recall that it actually was part of "The Book Thief". I appreciated that the book painted a picture of probably a very normal household in the second world war. The empathy, sympathy and the human-kindness that was alive and well and bursting to the surface, quietly of its' own accord, made me feel for each and every character in the book. All in all a great read. I would definitely recommend it and not just to young adults. It really was a fantastic book and I would even go as far as to say this will become a classic from this era. Loved this beyond words. I just finished "The Friendship Bread" this morning. The Book Thief might be my next read. Have a nice Sunday.